At the copier this morning, I found an old vocabulary graphic organizer. It was that one with “definition, picture example, and non-example”. I had forgotten about this type of organizer and tried it out with my class this morning. They loved it! We used the graphic organizer for one of our spelling words (of the students’ choice). My more independent students were able to look up the definitions on the computer and complete the paper themselves. My newer students and I worked on the sheet together…it was a simple and great vocabulary activity for everyone! The only problem? The paper was a little (ok a lot) outdated and hard-to-read. So I whipped up my own version this evening. I added some different categories, such as “suffixes” so we can write the different tenses/forms of the word. I also added a “related words” category, since I know this is something that will be very useful for my ELL students. I hope it is something you might be able to use as well! Do you have any favorite graphic organizers for vocabulary? Or activities for vocabulary that work well for your students? I do weekly writing prompts with my kids on the vocabulary words. For example, one of our words this week is tempting. I am having the students list and draw foods that are tempting to them and then write a sentence with the word. I found that they forgot the words too easily when they used the activity from our unit. Thanks for sharing this template! I had to laugh when you said you "found it" on the copier. I can't tell you how many times great things have been discovered abandoned on the copier!! Thanks for reworking it, looks great as always!! Not that it has anything to do with this post – but I LOVE all your printables – labels, signs, etc. I especially love that they use Thistle Girls graphics since I already have some of those in my classroom, so it all matches already, without me having to do any extra work. What a great idea, lends itself to so many abilities especially when you have a class of 31. Thanks for sharing. I absolutely love this. Thanks for sharing! As a new teacher I am collecting as many different ideas as possible. I can see this being one of my favorites for vocabulary. Getting ready for school to start I have been stumbling upon a bunch of great blogs and ideas. I absolutely love your ideas and files you are sharing. 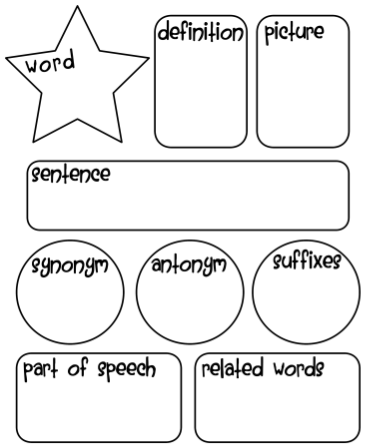 I really like this vocabulary graphic organizer, I would like to modify it for a bit for my third graders but am not sure how. Could you share how you modify it or create one with just the word, definition, picture, sentence, synonym, and antonym? Sorry Amanda, I do not have the original anymore–I store a lot of items like that on Google Docs or my computer would be overloaded! Thanks so much for stopping by! Thanks for sharing this; it's fantastic! I had to pin it! Wow! I just saw this on Pinterest and just had to come and find it on your blog! Golly! Congratulations on everything. Thanks so much for all you share! You are amazing! Thanks a million for your tutorials, too! I ♥love, ♥love, ♥love them! This is great! I currently use something similar, but your layout is much more kid-friendly and fun to look at. Thanks for sharing! I love your version of this vocabulary graphic organizer. I love this! Thanks for the freebie! I will definitely be using this. I love that it is simple and cute too! Thanks so much! I use a version of this in my classroom, but this one is much nicer. I've taught for many years and have five teaching areas. This year I am a new ESL teacher looking for materials for vocabulary instruction and I love this organizer! I already use a word map; I adapted amine from the Frayer model, but this one is better because it has more areas for information and is so kid-friendly! Oh thank you!! I'm so glad you can use it! This is a fabulous graphic organizer! Always looking for great vocab ideas. Thank you!